Ahoy all ye geocachin' pirates, adventurers, an' ladies an' gentlemen of fortune! We be musterin' up seven crews to come to the aid of those misfit pirates what sail aboard the Black Barnacle. Though their past misadventurin' be legendary, this time Captain Jack an' his crew of scurvy skallywags are in quite a pickle for they be marooned far from the sea. While they were misbehavin' and misdemeanorin' in the Gulf o' Mexico, a whale of a storm appeared and pushed the Black Barnacle toward Mobile Bay and right into the mouth of the river. Lost in the fog, the Crew kept sailin' -- an' a-sailin' -- until the Black Barnacle ran aground near Rome, Georgia. An' there they be, waitin' for ye to come hunt for treasure in this strange, faraway land an' perhaps lend a hand (or at least a hook) in getting them back to the sea. Arrgh! Once registration opens (May 1) attendees may register in one of seven pirate crews. Each crew will have their special Captain, Ship Name, Jolly Roger Flag and crew colors. Crews will accumulate points throughout the events and activities. The victorious Pirate Crew will be announced at the closing ceremonies of the Going Caching Mega-Event. Pre-Event Shirts will be available May 1st. Get your hands on this year's pre-event t-shirt and solve a puzzle which leads to a loggable geocache hidden somewhere in Rome, Georgia. Only puzzlers who solve the shirt will know what to do and where to look for the final clues during Going Caching 2019. The final clues, the geocache and the $100 FTF prize can be found beginning Saturday, October 5th. Early arriving geocachers have no advantage on this one. A Matey Match Button is included in every paid registration package. Wear your button while keeping an eye out for another one just like it. After meeting up with your match, both of you come to the Going Caching Store Tent to spin the prize wheel and see what you each win! Assemble puzzle pieces in your trading card packs to obtain the clues you need to solve the pirate's dilemma in downtown Rome. Obtain your passport and depart on the Pirate's Challenge where you search for treasure while visiting brand new geocaches and other ports of call. You choose which geocaches and adventures to find. Accumulate enough points to earn a trackable Challenge geocoin. Passports will be included in each paid registration package and will be available separately in our Going Caching Store. One passport per individual. Enjoy geocaching lab cache creations by the Going Caching Crew. Visit the geocaching.com Help Center to learn more about lab caches. A link will be posted on this cache page and an announcement will be made when the lab caches are activated. 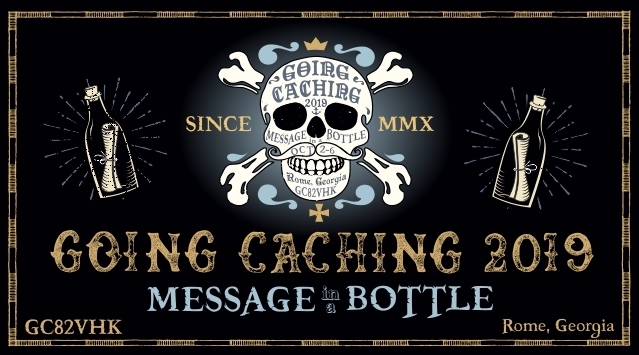 ● There is no charge to attend any of the Going Caching 2019 events. Some of the activities during these events do require certain items that can be purchased in our online store. ● Store purchases may be picked up all events except Thursday evening’s Flash Mob event. Except for Pre-Event Puzzle T-Shirts and items from previous Going Caching events, we cannot ship purchases prior to the event. If you are interested in purchasing but cannot attend, please contact us through our website. ● Parking is free at Ridge Ferry Park. A special parking permit for an up-close and reserved (just for you) parking spot is included in the Patron-level registration package. Adequate parking for those with official disability vehicle tags or placards will also be available. Please obey all city and county parking regulations as you make your way to find the geocaches. ● Pets are welcome at Going Caching 2019 but must be on a 6' leash at all times. Pets are not permitted in any tents, pavilions, buildings, stage, escape rooms or cooking areas at the event venues. Look for the "Paws Permitted" decal to see which shops and restaurants in town are pet friendly. Please be a good pet owner and clean up after your pet.